Dennis the Menace strike probability chart for today. First party boat with live jazz band. The second party boat with live jazz. 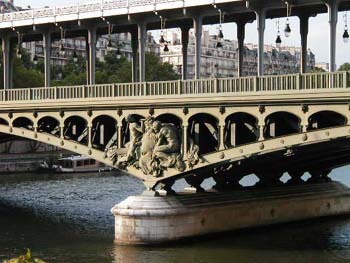 The bridge at Bir Hakeim is at one end of the Allée des Cygnes. I just love those hanging lamps. Whew. 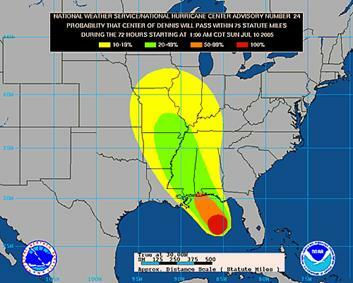 Our home is now outside the “cone of uncertainty” for Hurricane Dennis strike possibilities. Now I just hope it does not strike New Orleans. And I hope it weakens to a timorous thunderstorm. And just as Londoners are doing, we are going on with life as usual. We won’t allow any concerns about terrorism to deter us in our pursuit of happiness in Western civilized life. Going on as usual is the only way to keep those terrorists absolutely defeated in accomplishing their goals. We had a lovely walk yesterday evening. It was just a typical walk, up to and along the Allée des Cynes and back into our neighborhood. 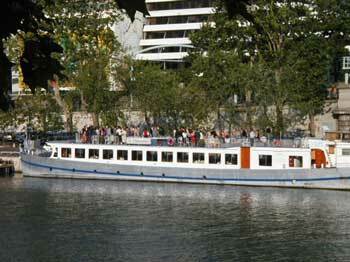 When we reached the Seine, there was a live jazz band playing on one of the big party boats. Well, at least there was a horn player and a pianist. People dressed up in suits and party dresses where enjoying the music and drinks on the top deck. I felt like we were in a Woody Allen movie romanticizing Paris. The weather, the view, the conviviality, and the jazz. It was perfect. We walked on. Then when we were on our way back, the party boat had been launched and it passed slowly by us, with the jazz band – now complete with drummer and guitarist – playing away. Lovely. Then there was a second party boat, with similar music, and similar convivial party goers. We stopped at L’Épopée (89 avenue Émile Zola, 01-45-77-71-37), one of our favorite restos, where we were very warmly greeting and where we dined on absolutely excellent food. We’ve been going there for years, and so I am now horrified to see that I omitted this place on my Restaurants 2003 page! In fact, that restaurants page is so out of date, I really must update it for you all very soon. I’ve been referring people to it, and now I see that some of the restos I mention are no longer in existence, and there are others that simply must be added. That will be a priority. L’Épopée is great, but they close too early in the summer for vacation. So if we don’t go there early enough in the summer, we miss out entirely. The place is slightly expensive, but worth every penny. Once they get to know you a little, the proprietors are very nice and friendly. The food is very French, and there are some strange things on the menu like terrine of leeks and beef tongue. But try the weird sounding stuff anyway – at a place like this, you can be sure it will be pleasantly surprisingly good. Although I admit I have not tried that terrine . . . yet! We both had duck breast (magret de canard), sliced thin and served with a rich, dark honey and red wine sauce and red cabbage soaked in honey and red wine to the point where it was sweet, with tiny golden raisons on top. My appetizer was a marinated sardine dish (not salty, but very fresh marinated strips of sardines that are much larger than the kind we get in tins). The sardine strips were on top of a compote made of finely minced tomato (flesh only) that must have had a fine vinaigrette holding it together. It was superb. You don’t know what sardines really are until you have them served this way. Night before last, we dined at Oh! Duo (54 av. Émile Zola, 01-45-77-28-82) again. Again it was absolutely great. The menu here has a lot of fish on it, so Tom struggles a little, but I am very happy. Madame Valéro could not be nicer. She remembered that we had been in England to see friends, and she was quite concerned about whether or not they were okay. I explained that they live in Oxfordshire and Hampshire, not London. We all agreed that the terrorists are barbarians. I should mention that Tom always has dessert at Oh! Duo: a tarte fine aux pommes. That is a very fine, thin apple tart that is freshly made on the premises, by the “patron,” Madame Valéro explained. Often the pastry desserts you get in a French restaurant are made elsewhere, at a bakery. But not at Oh! Duo. Everything is made there. In this case, the “patron” is Monsieur Valéro. I was feeling the need for vegetables so I had a gazpacho made with beets. Then my main course was a broiled fish called “rascasse” on a bed of perfectly prepared spinach with a light cream/butter/herb sauce all around. French food. This is what civilized life is all about.